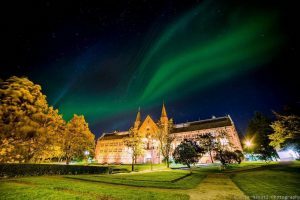 The Norwegian University of Science and Technology (NTNU) is the largest university in Norway today, with a history dating back to 1910. NTNU’s social mission is to create knowledge for a better world and deliver solutions that can change and improve everyday life. NTNU is headquartered in Trondheim, with campuses in Gjøvik and Ålesund. NTNU has the main responsibility for higher education in technology in Norway, and is the country’s premier institution for the education of engineers. The university offers several programmes of professional study and a broad academic curriculum in the natural sciences, social sciences, teacher education, humanities, medicine and health sciences, economics, finance and administration, as well as architecture and the arts. Research forms part of the activities through a variety of projects and programmes in addition to specialized centres. NTNU has four strategic areas of research in 2014–2023: sustainability, energy, oceans, and health. Through interdisciplinary collaboration, these research areas aim to address complex challenges of great importance for society. In addition, NTNU has strategic commitment to three enabling technologies in 2011–2020: biotechnology, ICT and nanotechnology. Enabling technologies involve interdisciplinary basic research that contributes to developing new industries, products and solutions in most sectors of society. Two researchers employed at NTNU have received Nobel Prizes: May-Britt Moser and Edvard Moser (2014). In addition, the laureates Ivar Giæver (1973) and Lars Onsager (1968) were educated at the Norwegian Institute of Technology (NTH), which was one of NTNU’s predecessors. NTNU in Brussels works to promote and strengthen NTNU’s image and participation in Europe. The office provides relevant information, operational consulting and support to NTNU employees willing to work in and contribute to the European Research Area. The office assist academic groups in identifying and participating in leading European networks and in long-term positioning with respect to relevant European organizations, alliances and platforms. The office also assist in identifying appropriate funding opportunities and building partnerships and consortia for specific funding announcements.